In Jindo Island, there is a natural phenomenon occurring at this island twice a year during Spring to Summer when the sea is parted between the mainland of Jindo and small Island called Modo, and showing 2.8 kilometers long and about 40 meters wide land bridge connecting two island for about 1 hours. This phenomenon may be called “Moses Miracle” by some Christians as it is liked the biblical story of Moses ‘s Red Sea parting, according to the Exodus account. 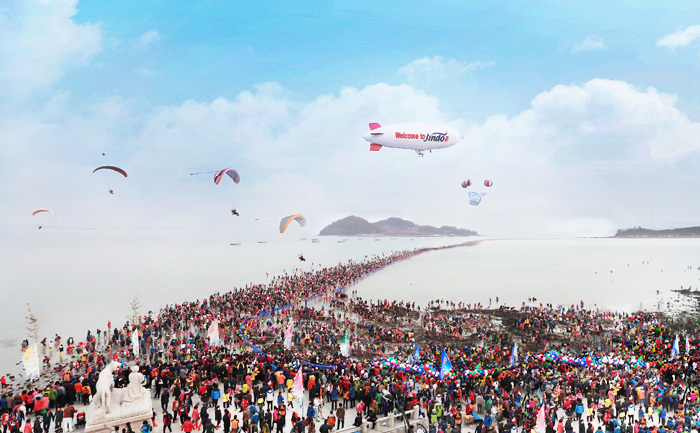 Koreans call this event as “Jindo Miracle Sea Road Festival”. Visitors will enjoy walking along the sea bed and picking up the sea shells or sea creatures, so do not forget to bring basket to keep fresh seafood for your dinner. But mind you, the sea will be splitting only for one hour, so please don’t forget to rush back to the seashore on time. There is a statue of old woman and tiger near the cost of Jindo which can tell the story of the miracle in Korean version. According to the legend, tigers were once abundant on Jindo Island. Tigers were invading the villages, so people fled to Modo island, but one women, named Bbyong, was left behind. She prayed to Yongwang, the god of the ocean, until at last the god told her in the dream that there would be a rainbow appearing in the seas the day after for her family to cross the ocean. When she woke up and went out to the sea, the sea water miraculously parted, and the rainbow road appeared for her family crossed the sea to meet her, then began a popular tradition among locals and a mystical sea splitting attraction among tourists. However, the sea parting is caused by the extreme low tide of the year which usually happened during March to June. This year the events was held during April 7-10, 2016. There are varieties of events during the festival; such as a folklore music concert, various street performances and artistic exhibition. At the festival, visitors can watch a dog show featuring the Korean Jindo Dog, a breed known to have originated from Jindo Island, and also famous known for their loyalty and obedience with performing impressive stunt during the show. 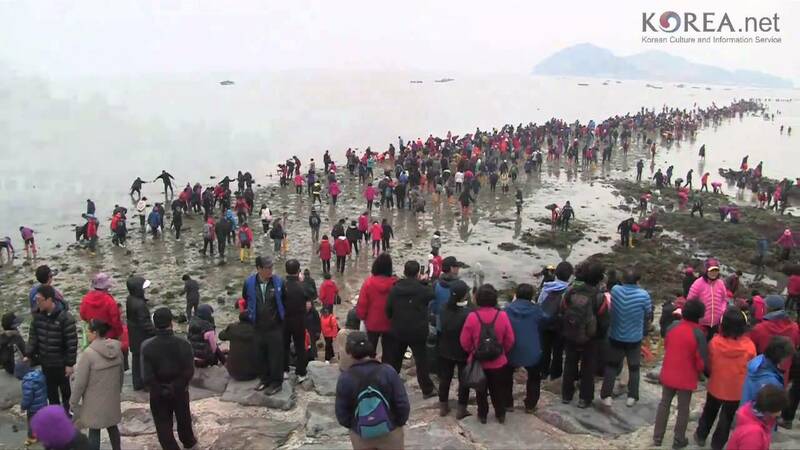 “Moses Miracle at Jindo Island” was widely known since 1975 when a French diplomat had a chance to experience this event, and wrote article about this in French newspaper. 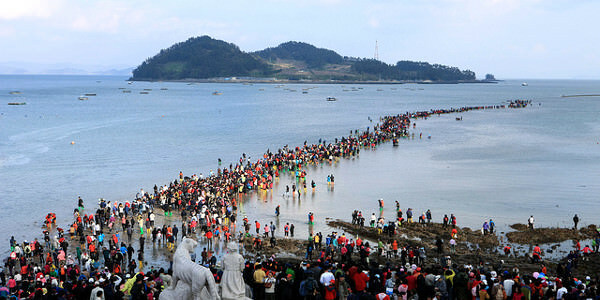 The venue of this festival: Jindo mysterious sea route, and the whole area of Gogun-myeon, Jido-gun, in Jeollanamdo Province. How to get there: take the intercity bus from Central City Bus Terminal(Seoul Honam Line) to Jindo Bus Terminal. This entry was posted in Events, Spot and tagged jindo, Korea.